High - Best quality setting. Only allows you 60-70 minutes of recording time, but it sounds the best. Low – Not the greatest quality. The amount of time offered might seem tempting, but the quality, I assure you, is not great. Once you have the stereo volume where you want it, restart your music, but pause it before the song starts. On your Music Player, with the quality setting selected, press the "Play/Pause" button to begin recording. As you press the button un-pause your music and it will begin to record. Do the same for any additional songs you’d like to record. The Music Player will let you know when it cannot hold any more songs. 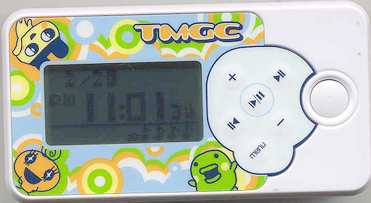 Band Stage – The tamagotchi that you’ve selected plays their instrument on the stage. You press the white button to make them play a note during the song. I won’t spoil it by telling you which ones they play. I’ll let you figure that out on your own. Dance Stage – When you first start your Music Player there will only be one dance background available out of six. The others can be unlocked by gaining points in the "Game Mode"
Surfing/Wave Riding – Your selected tamagotchi character will either ride in an inner tube, on a surf board, or on water skis. You must press the White button to make them jump over large waves. You only have 3 lives, so be very careful. If you can successfully complete the game and/or achieve a high number of points, you will unlock secret tamagotchi characters or dance backgrounds. Trampoline – Your tamagotchi must jump and catch the goodies that float across the top of the screen, but watch out for Poo. There’s a health meter across the bottom of the screen. Watch it carefully, cause when it empties your tamagotchi will fall. You can keep filling the meter by getting the food/treat items. But the poo will cause your meter to empty quickly. If you can successfully collect all the goodies and keep your meter filled up within the time limit you will win the game. By winning and/or getting a high score you can also unlock additional tamagotchi characters and dance backgrounds. When you start up your Music Player there are only three characters to select from. (Memetchi, Kuchipatchi, and Mametchi) You can scroll through those three and choose which one you’d like to use on the Game Mode or the Dance Mode. If you use all three in the Game Mode there’s a greater chance that you will unlock more secret items. If you use them in the Dance Mode each tamagotchi will play a different instrument. First – Song Edit – You can change the name of your songs at any time under this option. Second – Delete Song – You can delete unwanted songs here. It will ask you to confirm the delete twice. Third – Date and Time – Here you can reset or adjust the date and time. Fourth – Contrast – Use this setting to lighten or darken the screen. Also if you are not playing a game on the Music Player or listening to your music, the Date/Time Screen will show up in a few seconds of being idle. Info courtesy of Sarah H.